Greece clarifies it condemns all forms of discrimination, after PA leaders say removal of two Arabs from flight is reminiscent of apartheid. 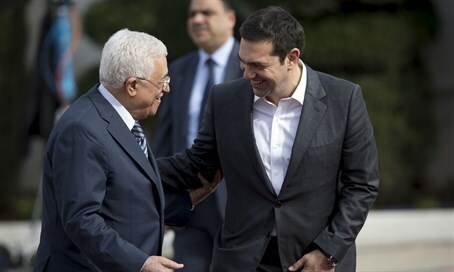 Greece on Thursday said it condemned all forms of discrimination, after Palestinian Authority (PA) leaders complained about the removal of two Arab passengers from an Israel-bound flight, and even compared it to the apartheid era in South Africa. The two Arab passengers with Israeli documents were forced off an Aegean Airlines flight before it set off from Athens on Sunday after Israeli Jews protested about their presence due to security concerns. After an initial complaint by passengers, the pair's documents were checked again by Greek security but no issues were found. However by this stage the protest had escalated, with dozens of passengers refusing to take off until the men were removed from the plane. The two passengers agreed to disembark from the plane and take a flight back to Israel the following morning. Saeb Erekat, Secretary-General of the Palestine Liberation Organization (PLO), on Wednesday condemned the decision to eject the two men from the flight and called it "unjust and disgraceful." "We are outraged by how two Palestinians were treated with discrimination and prejudice at the hands of the Aegean cabin crew prior to the departure of last Sunday's flight," he said in a statement. "We call upon the Greek government to take strong action against this racist act, including compensation for the two Palestinian passengers,” said Erekat, who then added, "This appalling behavior by the Israeli passengers is reminiscent of the worst years of the South African apartheid." Greece's justice ministry stressed Thursday that "the principle of equal treatment must be rigorously respected" for all passengers. It added it "condemned all discriminatory treatment on grounds of racial or ethnic origin, religious convictions or other" grounds. Aegean Airlines, which insisted that "discrimination runs counter to our principles," said initially just a handful of passengers expressed concern but that dozens then refused to take off until the men were removed from the plane. The airline on Wednesday had rejected the PA’s claims of racism and said it acted with passenger safety in mind while expressing its "greatest regrets for the event." The carrier also thanked the two men for their "understanding" over the affair. PA officials often use the apartheid argument to discredit Israel in the world, ignoring the fact that Israeli Arabs, however, have the right to vote, serve in the Knesset, study in Israeli universities, share the same hospitals and public facilities and work alongside Israeli Jews. At the same time, the same PA leaders who slam Israel’s so-called “apartheid” against Palestinians have clarified that if a Palestinian state is ever established, no Israeli citizen will be allowed to set foot inside.